In this beautifully illustrated book, Nooraini Mydin grabs you by the hand and takes you with her on a madcap rail adventure through 10 countries. She sleeps alongside 53 passengers in the open carriage of the Trans-Siberian train, traversing Siberia to take in the stunning views of Lake Baikal. 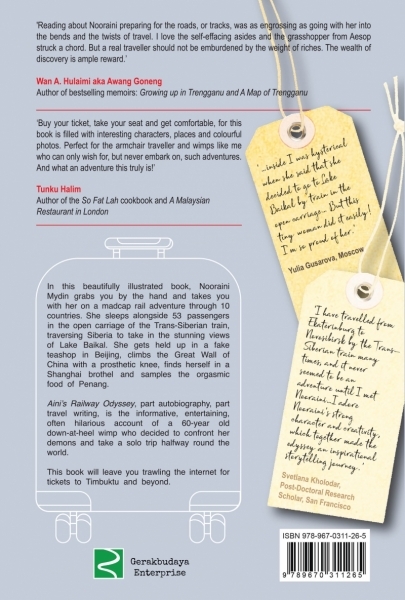 She gets held up in a fake teashop in Beijing, climbs the Great Wall of China with a prosthetic knee, finds herself in a Shanghai brothel and samples the orgasmic food of Penang. Aini's Railway Odyssey, part autobiography, part travel writing, is the informative, entertaining, often hilarious account of a 50-year old down-at-heel wimp who decided to confront her demons and take a solo trip halfway round the world. This book will leave you trawling the internet for tickets to Timbuktu and beyond.